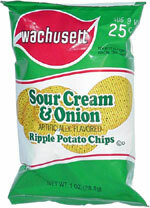 Taste test: These taste just like Ruffles Sour Cream and Onion (not the zesty kind, but the old-fashioned Ruffles) chips. If you miss the taste of the Ruffles, grab a bag of these. You can usually find them on sale, too, which is a bonus. Smell test: Very nice sour cream and onion aroma. This snack was discovered by Keith at Stop & Shop.